Transformation is the ongoing process of restoring our lives to original condition and purpose; finding our unique true identity and eternal destiny. It is also preparation for God’s judgment that is coming to the church (1 Peter 4:17). We are the church, an organic structure of relationships in the kingdom. In judgment, God is going to give His verdict (and the root of that word is ‘saying what is true’). He is going to say ‘yes’ and ‘no’ to the church: He will affirm and authenticate the true church, but there are aspects of the institution that we call ‘church’ that God is not pleased with, and He is going to make it abundantly clear that He is not pleased. Then people will face a choice: whether to stay with the institution, the religious structure, or whether to go for the relationship. And God is calling us into relationship. God is going to look at the scroll of our lives and see how it matches up with our scroll of destiny, all the vast thoughts God had about us; all that was written about our lives (Ps 139:16-17). Do our lives match up with how God intended them to be? We need to be ready to face that question and receive that judgment. We know this is not about sin; it is about whether or not we have done what God asked us to do, and with what motive. Each one of us will give an account of himself to God (Rom 14:11-12). The traditional understanding is that this only happens after we die, but my experience is that you can go to that judgment seat now. If we build with gold, silver, precious stones, wood, hay, or straw, the quality of our work will be tested with fire (see 1 Cor 3:11-13). It is the quality that is tested, not the quantity. The transforming fire of God will consume and burn up all those things that are not of Him, but will purify and affirm those things that are. In my personal experience of this, I was given a sealed scroll and brought to a place where there stood a Lamb. Many of the encounters we have in the heavenly realms are full of symbolism, and as I laid my hands on the head of the Lamb, just as the high priest laid his hands on the head of a sacrificial animal in the Old Testament, I understood that all my sin was laid on Jesus. I still had the scroll in my hands, and now in front of me stood a huge Lion. I walked into the darkness of His open mouth. It was a journey into the dark, until I came out into a place where there was a pillar of fire; and the fire had eyes which were looking into and piercing my soul. The Lamb and the Lion of the tribe of Judah is worthy to open the scroll (Rev 5). The seals on the scroll sprung open as I walked into that place and stood physically shaking and quaking in the presence of God. Everything I had done for Him was written on this scroll. Some things I knew immediately that He was really pleased about, because they were done in obedience and in the right heart. Others He was not pleased about, things I had done for the wrong motive, and I faced the fire of God’s presence as it consumed all that wood, hay and stubble,.and the scroll was purified. Then the scroll was turned over, and on the back showed all that I had missed, the opportunities to serve God and to do His will that I had allowed to pass me by. Once the eyes of fire had burned through it all, it was completely wiped clean, and God gave me an opportunity for a fresh start, to see my scroll of destiny fulfilled in the scroll of my life. It was a humbling, life-changing, difficult yet highly motivating experience. That judgment seat is about recompense, about reward in the age to come. Our reward is to be able to serve His purpose, to operate in rulership, but only according to the measure that we have fulfilled our destiny in this time. All of us can have access to that realm in heaven where our scroll gets dealt with in the fire of God’s presence. Ultimately, if we want real transformation, we will be glad to see the wood, hay and stubble burned up. The fire of judgment is not for punishment, but for transformation, purification and refining, so that our lives will better reflect Him. 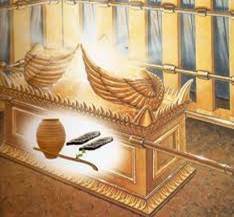 In the year of King Uzziah’s death I saw the Lord sitting on a throne, lofty and exalted, with the train of His robe filling the temple. Seraphim stood above Him, each having six wings: with two he covered his face, and with two he covered his feet, and with two he flew. And one called out to another and said, “Holy, Holy, Holy, is the Lord of hosts, The whole earth is full of His glory” (Isa 6:1-3). It is through us that His glory will fill the earth. The more we surrender to His purpose in our lives, to transformation, the more of His glory we will be able to display and the more that glory will fill the earth. And the foundations of the thresholds trembled at the voice of him who called out, while the temple was filling with smoke. Then I said, Woe is me, for I am ruined! Then one of the seraphim flew to me with a burning coal in his hand, which he had taken from the altar with tongs. He touched my mouth with it and said, “Behold, this has touched your lips; and your iniquity is taken away and your sin is purged” (Isa 6:4-7). In the fire of His presence there is nothing we can hide, nothing that is not revealed. In the presence of God, we see things for how they really are. This was a real experience for Isaiah. He knew he was ruined, undone. But there is something about patterns of sin and iniquity in our lives, over years and generations, which can be purged with the fire that comes from that altar. Angels are coming today, bringing the coals, looking for those who are willing to be refined and purified. Such encounters lead us to our destiny. Think of Moses, Joshua, and Saul on the Damascus road. Jesus lived a lifestyle of encountering the Father so that He could do what He saw the Father doing (John 5:19). Daily encounters with the living God in the heavenly Holy of Holies not of this creation will transform our lives, and give us direction day by day. We are being called into our identity and destiny as a Joshua Generation, a people transformed and ready for God’s judgment, authentication and mandated authority; a generation of believers who possess our heavenly and earthly kingdom inheritance and fulfil our eternal destinies; a people prepared to receive and disciple a harvest of supernatural labourers into their kingdom inheritance; a people to fill the earth with God’s glory. I call your spirit to attention. Spirit, listen as a true son. I call forth your identity as the Joshua Generation. I call forth your destiny to fill the earth with God’s glory. to administer God’s rule on earth as it is in heaven. to have charge over God’s heavenly courts. to stand in God’s presence and be displayed on the earth. and restore to it to original condition and purpose. to rise up and take possession of your inheritance. (this post is based on extracts from Mike’s notes for session 20). And You crown (surround) him with glory and majesty! It has always been God’s intention to have a people who would rule over the planet – and the universe – on His behalf. Man was to begin with the garden God made for him, and then go on to fill the rest of creation with the image and likeness of God. What was in heaven would be manifested on earth, and we would bring that rule of heaven to earth through our lives. We are made in the image of God, and are to be conformed to the likeness of Jesus. The word ‘likeness’ means ‘to resemble’, and the Greek word is ‘icon’. We are familiar with that word in the context of computers and smartphones: the icon is not the program, but it is a representation of the program, and when you click on it, you engage with the program it represents. When people interact with us, that interaction should reveal the true nature of God Himself, and provide a means for people to engage with HIm. reflected in us in three fruit of the Spirit: love, joy and peace (Gal 5.22). The 9 stones which covered Lucifer’s body [Ezek 28:13] reflected the 9 light strands of God’s DNA. As light-bearer, he reflected the nature of God out into the whole universe. When he fell, the universe was deprived of all that light. Perhaps that is why 70% of the mass of the universe is so-called ‘dark matter’. Lucifer had 9, but the High Priest’s ephod had 12 stones: 3 stones representing the 3 strands of human DNA now added to the 9 light strands of God’s DNA. The stones were arranged in a pattern, 3×4. 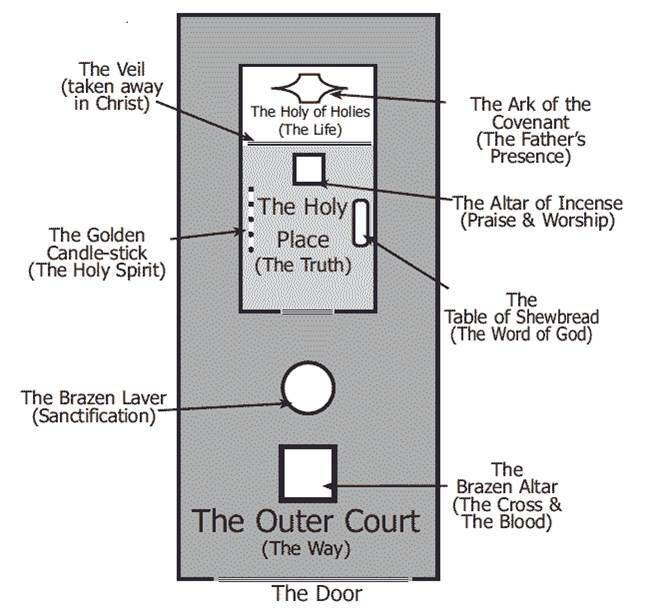 3 is the number of Kingdom government, and 4 is a doorway, portal or opening. When our DNA is joined to God’s DNA, it creates openings for the Father, Son and Spirit to manifest through us on the earth, so that people can gain a full understanding of who God is. Our DNA needs to be restored to its original condition, to the eternal image and abilities we should have. And 4 + 3 = 7, the number of perfection, where earth and heaven are joined. We can be joined to God genetically, His DNA entwined with ours; we can be transformed genetically, and be one spirit. This scripture speaks of an intimate relationship with God – beyond anything we can fully understand, but which God wants us to experience. We can be baptised (immersed, filled) in the River of Life to experience the DNA of Jesus; in the River of Grace to experience the DNA of the Spirit; and in the River of Glory to experience the DNA of the Father. When we ask, He will show us; and we will see our life reflected in the mirror of truth. Let’s not run from what we see; instead, let’s run to Him and embrace the transforming process He wants to bring about. When we break bread, we apply the body and blood of Jesus to deal with these things. We take the body and blood of Jesus and eat it, applying life to our marrow (the source of life within our bones), and speaking words of life to accompany it. We have previously shared the Communion Prayer we use here at Freedom Church, and we will add it to the end of this post too. For this is the will of My Father, that everyone who beholds the Son and believes in Him will have eternal life, and I Myself will raise him up on the last day (John 6:40). Your fathers ate the manna in the wilderness, and they died. This is the bread which comes down out of heaven, so that one may eat of it and not die. I am the living bread that came down out of heaven; if anyone eats of this bread, he will live forever; and the bread also which I will give for the life of the world is My flesh (John 6:49-51). There is a difference between eternal life and living for ever. The only reason I would die is if there is a record of sin within my DNA. I do not need to die, and neither do you. But we do need to undergo transformation by applying the body and blood of Jesus. Ian Clayton has met someone who is over 300 years old, still alive, but transformed and transfigured; translucent and shining. There are others too, and they do not look like you and me. The body and blood of Jesus carry the record of the DNA of God. We can age and die, or we can take the body and blood of Jesus within ourselves, and live for ever. So Jesus said to them, “Truly, truly, I say to you, unless you eat the flesh of the Son of Man and drink His blood, you have no life in yourselves. He who eats My flesh and drinks My blood has eternal life, and I will raise him up on the last day. For My flesh is true food, and My blood is true drink. He who eats My flesh and drinks My blood abides in Me, and I in him. As the living Father sent Me, and I live because of the Father, so he who eats Me, he also will live because of Me. This is the bread which came down out of heaven; not as the fathers ate and died; he who eats this bread will live forever (John 6:53-58). What then if you see the Son of Man ascending to where He was before? It is the Spirit who gives life; the flesh profits nothing; the words that I have spoken to you are spirit and are life (John 6:62-63). We apply the words of Jesus, the words He speaks as the Living Word of God. 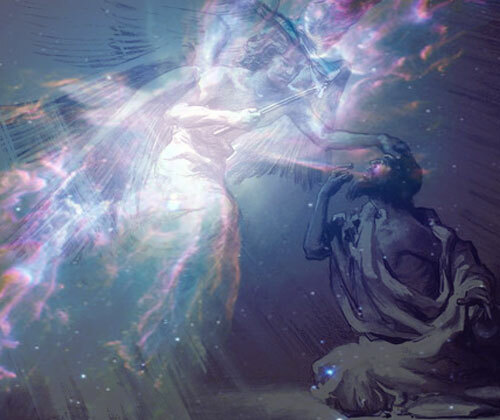 Again He said to me, “Prophesy over these bones and say to them, ‘O dry bones, hear the word of the Lord.’ Thus says the Lord God to these bones, ‘Behold, I will cause breath to enter you that you may come to life…’” I prophesied as He commanded me, and the breath came into them, and they came to life and stood on their feet, an exceedingly great army (Ezek 37:4-5,10). The breath did not enter a physical, flesh body.The very breath of God entered into the bones. In the middle of the bones is marrow, the source of life and the source of blood. We speak to our bones, that the breath would enter into our marrow and transform us. We apply the body and blood of Jesus. We speak into our bones and marrow at the genetic level. We say, ‘be transformed into the image of Jesus; be genetically purified and transformed from one degree of glory to another; be transfigured and radiate glory’. Whenever we eat, whenever we drink, we can take it as the body and blood of Jesus. With the words that are spirit and life, speaking to our marrow; we apply the DNA of God to transform our DNA into the eternal image of God that is our destiny. Let’s do this regularly, every day if we possibly can, because there is awesome power in it. [You can download a printable version of this prayer by selecting ‘Communion Prayer’ in the main menu, or click here]. (this post is based on extracts from Mike’s notes for session 18). For the word of God is living and active and sharper than any two-edged sword, and piercing as far as the division of soul and spirit, of both bones and marrow, and able to judge the thoughts and intentions of the heart (Heb 4:12). God is looking to see us transformed (Rom 12:2), and bone and marrow are the deepest level of transformation, at the DNA level. The bone speaks of the structure of our lives and the marrow speaks of the source – red and white blood cells and stem cells. Only 2% of the human DNA genetic code determines our physical appearance and characteristics. The other 98% used to be called junk DNA, but there are sequences, triggers and switches, in that 98% which turn on and off certain hidden attributes. For example, some diseases can be inherited but they only appear at certain times because of these triggers. Then God said, “Let the earth bring forth living creatures after their kind: cattle and creeping things and beasts of the earth after their kind”; and it was so (Gen 1:24). For the coming of the Son of Man will be just like in the days of Noah (Matt 24:37). Therefore we need to understand what it was like in the days of Noah, and we have posted about this before. There was genetic manipulation taking place in the time of Noah, and even after the flood, giants appeared in Ham’s genetic line. Today there is a lot of genetic modification not only within species but between them. Scientific researchers are mixing DNA from animals and plants, which has been forbidden by God. GRIN technologies (Genetic, Robotic, Information Technology and Nanotechnology) are designed to transform human abilities. If they have cloned Dolly, the sheep, then certainly someone, somewhere is looking to clone a person, even if this is banned. All these things are taking place now, in the times leading up to Jesus return. Satan put in place two strategies to try to prevent the seed of woman ever being born. Firstly he traded with Adam and Eve to acquire human DNA. In killing Abel, Cain demonstrated the nature of his true father (just what Jesus saw in the Pharisees (John 8:44; Matt 23:31-32)). The sons of the evil one in the parable of the tares (Matt 13:38) are his sons genetically, not just spiritually. Satan has always tried to wipe out the pure seed. He knew the pure seed would be his undoing. On the cross Jesus fulfilled that Genesis 3 prophecy by destroying satan’s work. Now it came about, when men began to multiply on the face of the land, and daughters were born to them, that the sons of God saw that the daughters of men were beautiful; and they took wives for themselves, whomever they chose (Gen 6:1-2). And angels who did not keep their own domain, but abandoned their proper abode, He has kept in eternal bonds under darkness for the judgment of the great day, just as Sodom and Gomorrah and the cities around them, since they in the same way as these indulged in gross immorality and went after strange flesh, are exhibited as an example in undergoing the punishment of eternal fire (Jude 6-7). The Nephilim [the word comes from the Hebrew for ‘fallen ones’] were on the earth in those days, and also afterward [after the flood] when the sons of God came in to the daughters of men, and they bore children to them. Those were the mighty men [Gibborim] who were of old, men of renown… Then the Lord saw that the wickedness of man was great on the earth, and that every intent of the thoughts of his heart was only evil continually (Gen 6:4-5). Adam and Eve had been made in the image of God, but within 1200-1500 years men were ‘only evil continually’, so that God had to wipe them all out. The Lord was sorry that He had made man on the earth, and He was grieved in His heart. The Lord said, “I will blot out man whom I have created from the face of the land”. But Noah found favour in the eyes of the Lord. These are the records of the generations of Noah. Noah was a righteous man, blameless in his generations; Noah walked with God. Noah became the father of three sons: Shem, Ham, and Japheth (Gen 6:6-10). Noah walked in the realms of the spirit with God, just like Enoch. And the phrase ‘blameless in his generations’ is very important: God found one man who was genetically pure. We do not know about his wife, or his sons, though if you look at how Ham behaved later (Gen 9:22-25), it is not surprising that we find Nephilim on the earth again even after the flood (Gen 6:4). We all come from those 3 families, so our DNA may well be polluted. Maybe it already affects us today, or maybe it is ready to be ‘switched on’ to affect us in the future. We need to deal with it so that we become genetically pure. Then God can ‘switch on’ the supernatural abilities that were lost by Adam. Satan fell in eternity. God formed time to contain satan’s sin, and in eternity to come there will be no record of what he did. 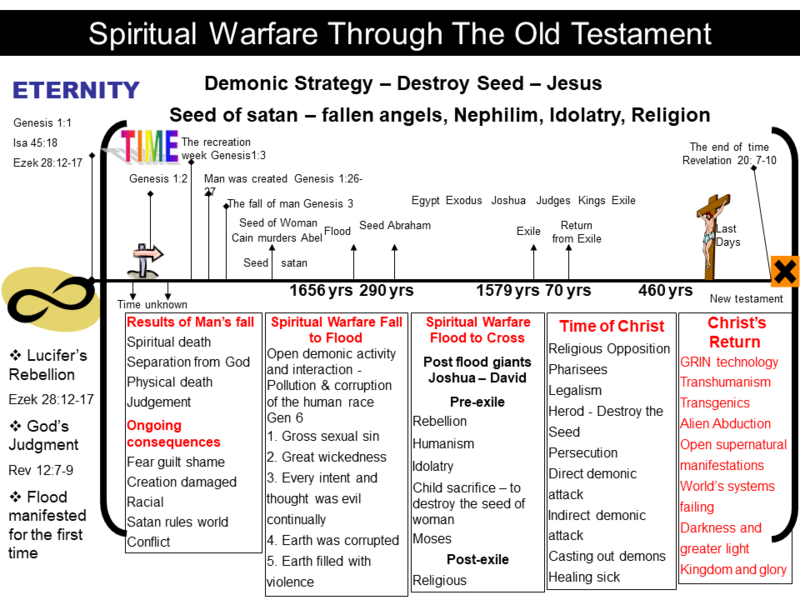 But through out Old Testament times, satan tried to pollute the seed. Randy DeMain has written extensively about the resurgence of Nephilim today. If the days of Noah were days of genetic impurity, he suggests that so too will be the days leading up to Jesus’ return. The Nephilim will not turn up this time as giants: they have refined their methods and will use such techniques as transhumanism, hybridization, genetic DNA modification; perhaps even hybrids developed by trans-dimensional beings from DNA harvested through what is popularly known as ‘alien abduction’. This may all be starting to sound like the X-Files, but perhaps ‘the truth is out there’. The agenda is to destabilise financial and government systems, causing chaos and destruction; to use science to establish genetically engineered retroviruses, contagion, and plague agents; to use the media to popularise and desensitise us to such concepts as vampires (there are no good vampires, whatever the creators of the Twilight saga would have us believe), werewolves, zombies and aliens. We need to be aware of such an agenda, but not fearful of it. The purpose of all this is to rob man of his inheritance. The devil comes to rob, kill and destroy (John 10:10) but Jesus came to destroy the devil’s works. God’s desire is to have the earth full of the sons of God. We are looking to an end time harvest of souls in which people will be rescued, saved, delivered, transformed, healed and brought into wholeness before Jesus’ return. We have a lot of work to do, and we must demonstrate the power that Jesus worked in. When the world is falling apart, we need to have the answers (both natural and spiritual) that people will be looking for. God wants ‘the church in all her glory’ (Eph 5:27) to represent and manifest His glory, His manifest presence flowing through us. For that to happen, transformation needs to take place in us on each level: separation of soul and spirit; dividing the thoughts and intentions of the heart; bone and marrow (Heb 4:12). We need to be genetically pure: spirit, soul and body. In coming posts we will look at how we can apply the power of communion, the blood of Jesus and the DNA of God, so that nothing remains in our genetic make-up for the enemy to use to rob us of our inheritance. 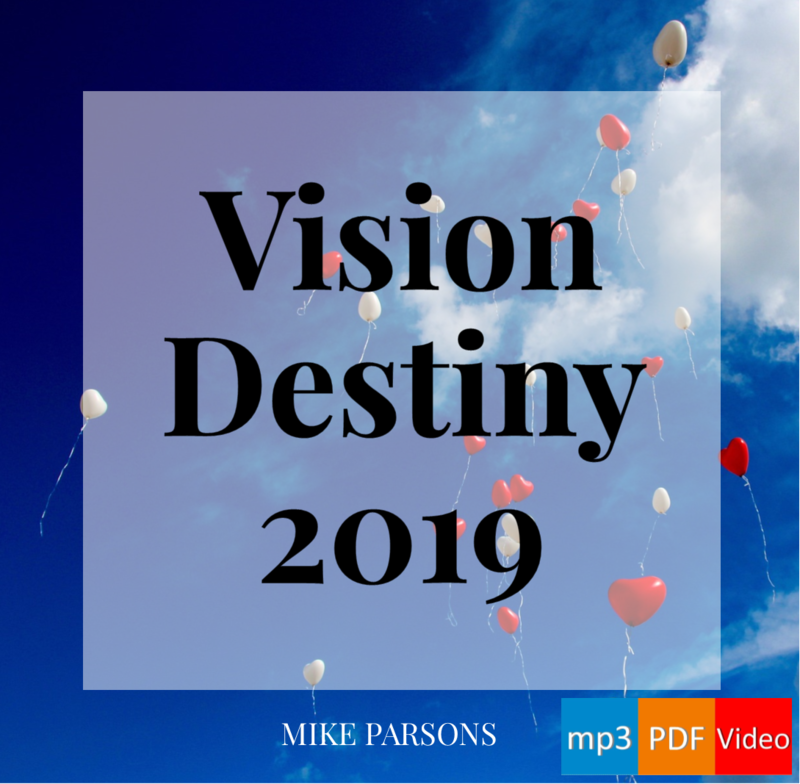 Transformation 20-part audio series with slides (this post is based on extracts from Mike’s notes for session 15).